New copy of Marvel Monsters (Hardcover) from Marvel Comics. US$20.90 which includes shipping with USPS Media Mail within the continental United States. Orders placed before 4PM EST ship same-day. Published: February 2006, Original Cover Price: $20.99 1st printing. Marvel's monsters unleashed in four timeless tales by today's hottest creators! In Monsters on the Prowl, it's the Hulk, the Thing, Giant-Man and the Beast vs. a tidal wave of classic creatures when the Collector inadvertently lets loose Droom, Grogg, Goom, Rombuu, Grattu and more on New York City! In Devil Dinosaur, two young Celestials debate prehistoric Earth's superior life form. But when the ferocity of Devil Dinosaur proves no match for the opposition, a savage from the future is brought back for a battle you thought you'd never see: Hulk vs. Devil Dino! In Fin Fang Four, four giant monsters - incarcerated for years for their crimes against humanity - now find themselves shrunk to human size and working at the home of the very people who captured them: the Fantastic Four! Meet Googam, Son of Goom; Elektro; Gorgilla; and Fin Fang Foom! But when Goom's mad plan to rescue his father goes awry, the quartet must put aside their differences and become - the Fin Fang Four! And in Where Monsters Dwell, witness the terror of Monstrollo, the horror of Manoo and the fright of Bombu! 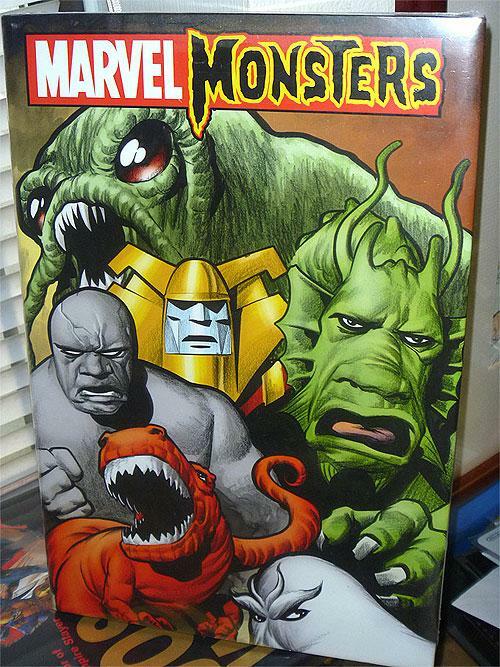 Collects Marvel Monsters: Devil Dinosaur, Fin Fang Four, Monsters on the Prowl, Where Monsters Dwell & Marvel Monster Handbook. Hardcover, 224 pages, full color. Cover price $20.99. Books in NCS' inventory are brand new and never read but please note that some books may have slight ruffling of the dust jackets due to years in storage and transportation from warehouse to warehouse.